Hello from Houston! No, I didn’t have a problem last week, just plain forgot to post. I was flying from MA to Missouri, loading my booth quilts, tools and patterns into my dad’s car and starting my drive to Houston, TX!! I enjoyed a great visit with a college sorority sister on the drive down. Thanks Lisa!! Market finished yesterday! It was good to see many shop owners who carry my tool and patterns and meet new customers! My booth pic is below. 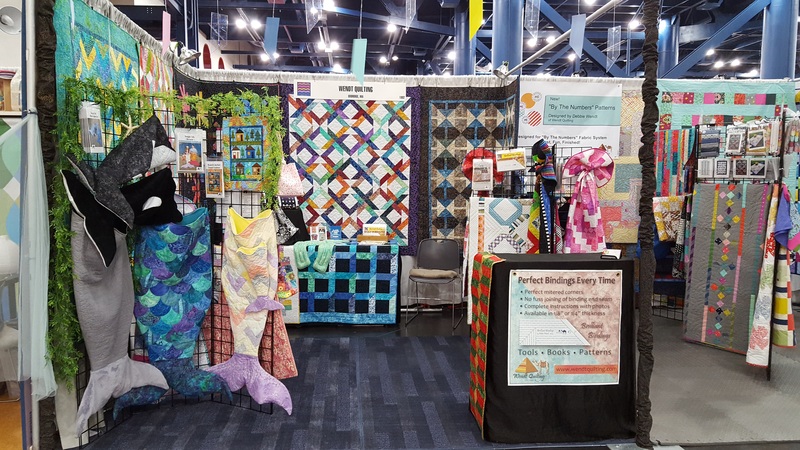 Gina Zeleznok of Sturbridge Quilting and Sewing and I used part of each of our booths for the “By The Nnumbers” patterns/quilts. It was very well received and we are so excited to have “new” shops carrying my patterns and implementing “the system”! In getting ready for Market, I took some photos for my new cover quilts. See “Skinny Bits” below. It can be interesting to see what is around when getting the favorite shot. I love how the yellow leaves play with the fabrics! I’m showing “Skinny Bits” on the sheet so you can see the binding. 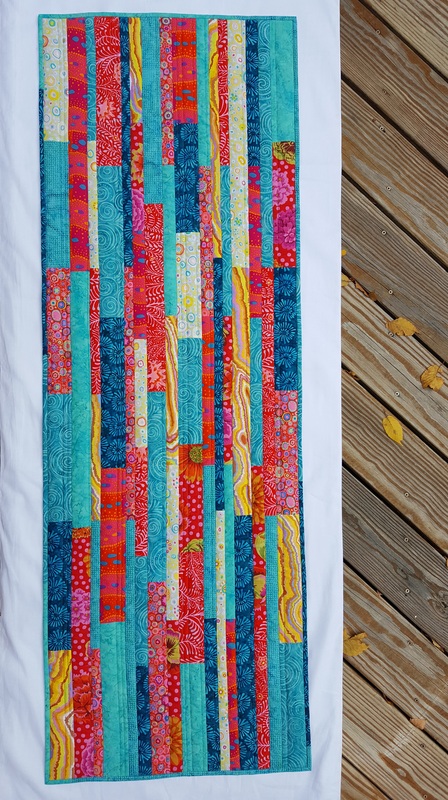 This quilt is a good example of when to use a straight seam continuous binding. There are so many lines both across the quilt and vertically, it was fitting to have the binding seams follow suit! 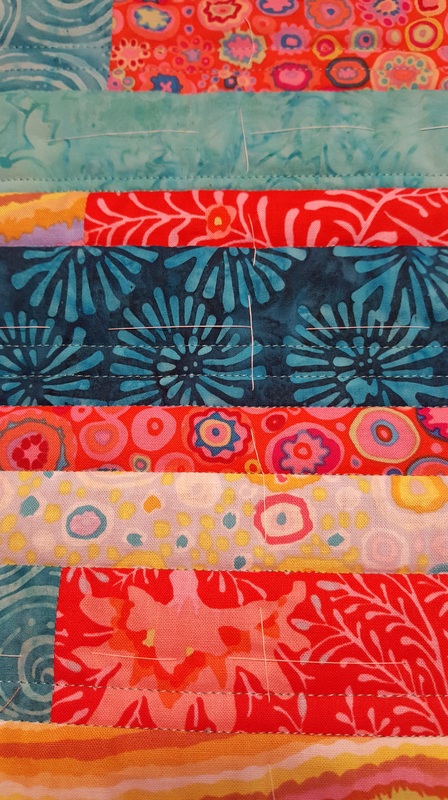 #1 – Try straight seam continuous binding. It might be the better look for some quilts! In quilting “Skinny Bit”, I used my domestic machine. I prefer to hand baste the quilt sandwich instead of safety pins. If you look closely you can see the white thread. I’ll show a larger look and close up below. -I feel it holds the layers better and keeps them from shifting. 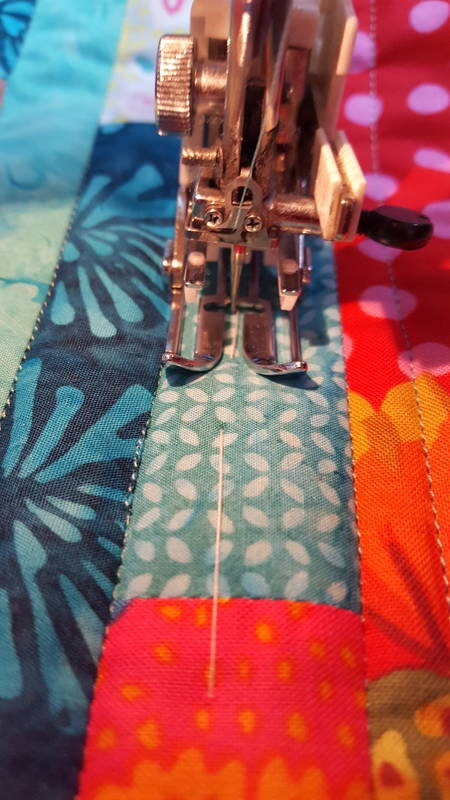 – It is easier to clip a thread when stitching along. – No pins to un clip as you go. – A thread is much easier to snip if it gets caught in the foot rather than mangling a safety pin. – If you run over a thread, no damage…look out if you hit a pin! I’m staying for Festival!! Come see me in Booth #1802! Linda Gosselin will be helping me in the booth? Thanks Linda! We re-arranged a few things tonight. I’ll post the final booth arrangement over on FaceBook. A request, can you please let me know in the comments section if you were able to open and view my videos from a week ago? Thanks. This entry was posted in Brilliant Bindings, Patterns, Quilt shows, Quilting. Bookmark the permalink.